An artist's illustration of an intermediate-mass black hole in the foreground as it distorts light from a more distant globular star cluster in the background. For decades, astronomers have tracked black holes with masses millions of times that of the sun, as well as those with tens of solar masses. But black holes between those two extremes have proved elusive. Now, astronomers studying a globular cluster have found just such a black hole at its center, showing that intermediate-mass black holes could be hiding out in these compact agglomerations of stars. Lead study author Bülent Kiziltan, an astronomer at the Harvard-Smithsonian Center for Astrophysics (CfA), and his co-authors Holger Baumgardt (of Australia's University of Queensland) and Abraham Loeb (also of CfA) found a black hole between 1,400 and 3,700 solar masses at the center of 47 Tucanae, a globular cluster in the southern sky some 16,700 light-years from Earth. Kiziltan and his team found this one by measuring motions of pulsars within the cluster. They found the telltale signs of a compact, massive object in the cluster's heart. The likeliest explanation for the motions was a black hole. 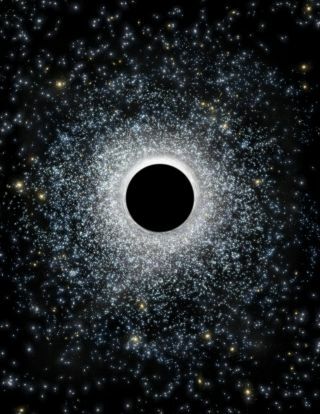 "Intermediate-mass black holes have been expected [in globular clusters] for many decades," Kiziltan told Space.com. "But we've not been able to find one conclusively." This artist's concept is a representation of an intermediate-mass black hole that scientists say may be present in the center of the globular cluster 47 Tucanae. A study suggests the black hole has the mass of 2,200 suns. Theorists think stellar-mass black holes form from stars that are at least a few dozen times the mass of the sun. When they run out of nuclear fuel, there is no longer enough energy from radiation to hold the star's outer layers against its immense gravity. The star collapses, and then explodes as a supernova. (Supernovas can outshine the galaxies in which they reside.) What's left of the star then shrinks into a tiny volume. A 100-solar-mass star, as a black hole, would have a radius of about 180 miles (290 kilometers). The former star's escape velocity exceeds that of light, resulting in a black hole, from which nothing can escape. The problem is, black holes are visible only when stuff falls in them. As such, the researchers needed another method that didn't depend on picking up radio emissions. That's why Kiziltan and his colleagues decided to look at the pulsars that inhabit a globular cluster. Pulsars form from stars less massive than those that make black holes. After those stars go supernova, they collapse into neutron stars. Some neutron stars spin rapidly and emit radio waves along a line offset from their rotational axes. These are called pulsars. Earthbound observers see them if Earth is in the radio beam as it sweeps across the sky. Pulsars' rotation rates change so little that they are precise timekeepers. They are precise enough that by timing the signal and looking for any Doppler shifts, it's possible to measure a pulsar's movement along one's line of sight. Kiziltan's group tracked the movement of some two dozen pulsars and used computer simulations to model the cluster to track down their black-hole candidate. "We're proposing a brand-new approach to the study of globular clusters," Kiziltan said. "It's not only that we see the dynamical signature of a black hole, but how to probe the region near it without going too close to it." Probing the centers of globular clusters is usually difficult, because the density of stars makes it hard to see what's going on. Finding the intermediate-mass black hole raises more questions about how these black holes form, said Cole Miller, a professor of astronomy at the University of Maryland who studies black-hole formation. "Let's say it's an intermediate-mass black hole," he said. "How did it get there?" "Globular clusters have small escape speeds," he said. "So the stars should blow away all the gas." There will be some as stars age, such as a red giant's stellar winds. "But that amount of gas is nowhere close enough to make an intermediate-mass black hole." This differs from the supermassive black holes at galactic centers, he added, because one would expect lots of matter to accumulate there, feeding a black hole and allowing it to grow very fast. Both Kiziltan and Cole said there are several ways to grow black holes early in a cluster's history. "One of my favorites is runaway collisions of stars or stellar- mass black holes," Miller said. "An interesting effect is, if you have a bunch of stars in a dense stellar region, the heaviest will start runaway collisions." Once a black hole forms — perhaps when a star that's absorbed a few neighbors dies ― all the matter that isn't in a stable orbit around the black hole will fall in or get ejected from the cluster, he said. That puts an automatic stop on the black hole's growth. For scientists to get a better handle on how such black holes might form in clusters, more of them need to be found — but that won't be easy, Kiziltan said. The only reason it worked for 47 Tucanae was that there were enough pulsars in it to begin with, and they were close enough to see. Not every globular cluster has the right combination of distance and bright pulsars. The study appears in the journal Nature today (Feb. 8). Follow us on Twitter @Spacedotcom. We're also on Facebook & Google+. Original story posted on Space.com.